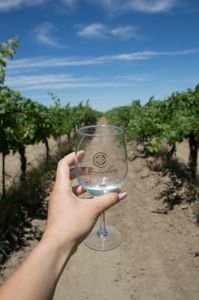 Have you seen Groupon and Trip Advisor deals for tours of Southwest Michigan wineries? Right when Groupon was about to go public, I remember seeing these kind of deals in my inbox regularly. This will be no surprise to anyone who knows anything about me, but I’m not a fan of groups of drunk people on buses. 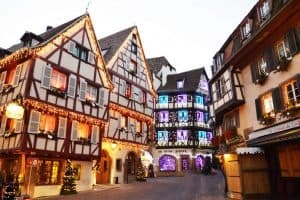 What I do enjoy, however are small group wine tours in comfortable transportation with responsible people. Even more, I enjoy good wine with a delicious meal. I’m not really into drunken debauchery or drinking on an empty stomach. 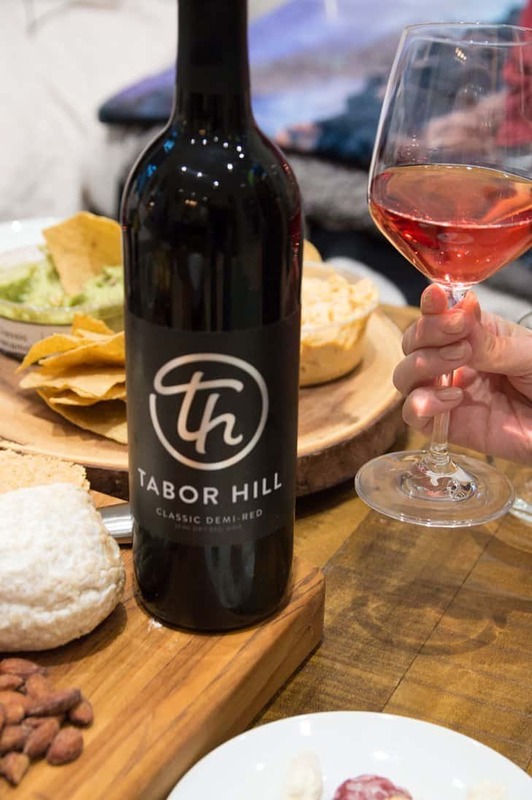 Lucky for me, Tabor Hill is one of the Southwest Michigan wineries with the most innovative wine and delicious restaurants in the area. Prefer cider to wine? Learn about Southwest Michigan’s incredible winter wassail festival. While I can’t skip town to visit Tabor Hill until after wedding season is over, I can recreate the Tabor Hill experience at home. Two of the Tabor Hill Wines we tried: Chardonnay and Rosé. For wine night with my family, I brought four different Tabor Hill wines. It included Rosé, Chardonnay, Classic Demi-Red, and one of their newest offerings, the Demi-Sec Sparkling. Because we were tasting some sweeter wines that I didn’t have too much experience with, I turned to both the head Chef at Moersch Hospitality Group and my trusty Wine Folly pairing poster to determine what items to pair. For the Demi-Red, I brought an aged gorgonzola wedge in order to cut some of the sweetness. While we didn’t find the wine overpoweringly sweet, I think the gorgonzola really worked to make sure of that. For the Demi-Sec sparkling wine, I specifically bought my favorite cheese in the whole world, delice de bourgogne. It’s salty and smooth, a soft triple-creamed cows milk that is like butter. 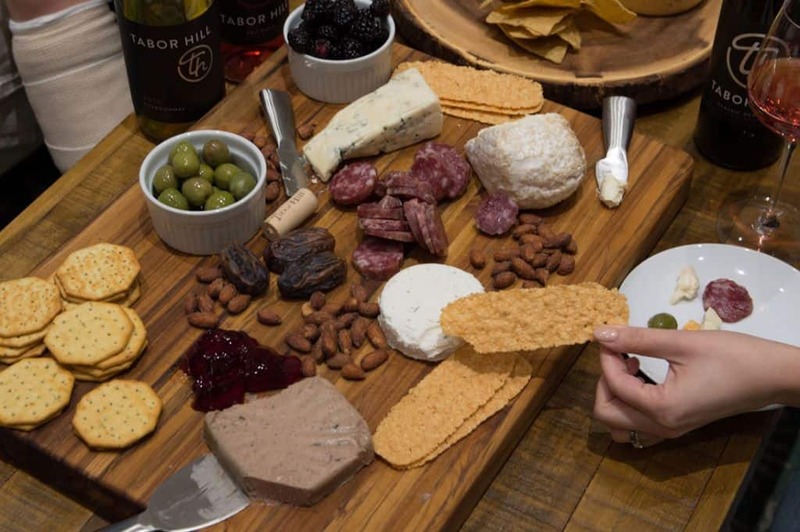 I brought salted almonds and parmesan cheese crisps to go with the Tabor Hill’s Chardonnay, and, per Moersch Hospitality Group’s Culinary Director Ryan Thornburg, a lavender honey goat cheese for the Rosé. When you make cheese and fixings your dinner, you better keep a stacked board. I rounded out the board with rosemary crackers, chicken liver mousse, fennel pollen dusted hard salami, castelvetrano olives, blackberries, and homemade cherry preserves. 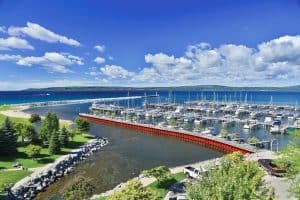 Looking for more wineries in Western Michigan? Check out more as part of 8 things to do in Ludington. It was exceptionally bold of me to think that my brother- and sisters-in-law would drink four bottles of wine on a Friday after work. While I brought four, we actually only finished two and a half because, well, we all have a 10:00PM bedtime nowadays. We managed to try the rosé, the chardonnay, and the demi-sec sparkling. A few of us had tried wine from Southwest Michigan wineries, but for those who hadn’t, Tabor Hills Wines were a pleasant surprise. 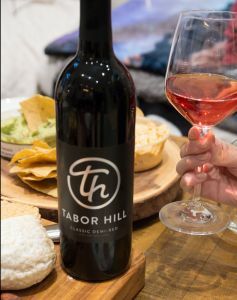 Hands down, the Tabor Hill Rosé was our favorite. It was bright, with flavors of strawberry and raspberry, medium bodied wand perfect for summer. It’s very fruit forward and was perfect with our charcuterie board. The sparkling demi-sec had delicate bubbles and a minerality that balanced nicely with the sweetness of the wine. Finally, the Tabor Hill Chardonnay was tasty, but had more of a Pinot Blanc taste. It was very tart and we all thought it was great, but not what we expected from a Chardonnay. 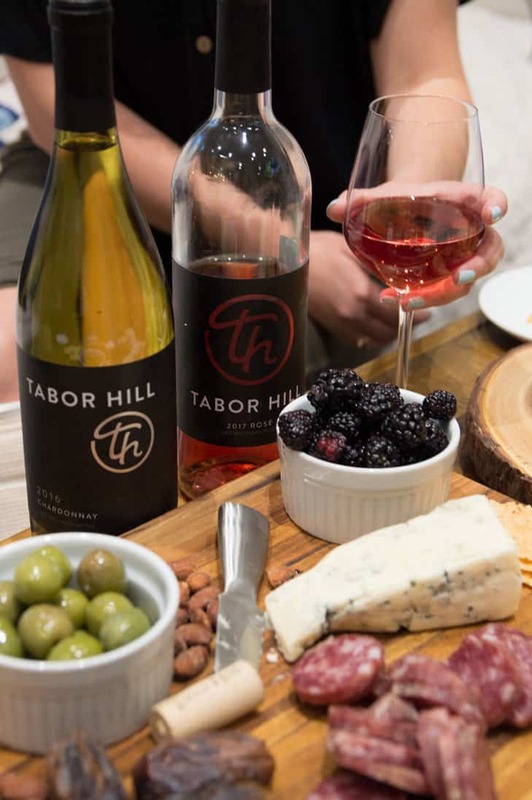 Whether it’s part of a longer stay in Michigan or a weekend trip from Chicago, a stop in to Tabor Hill for wine tasting and lunch is a great option. 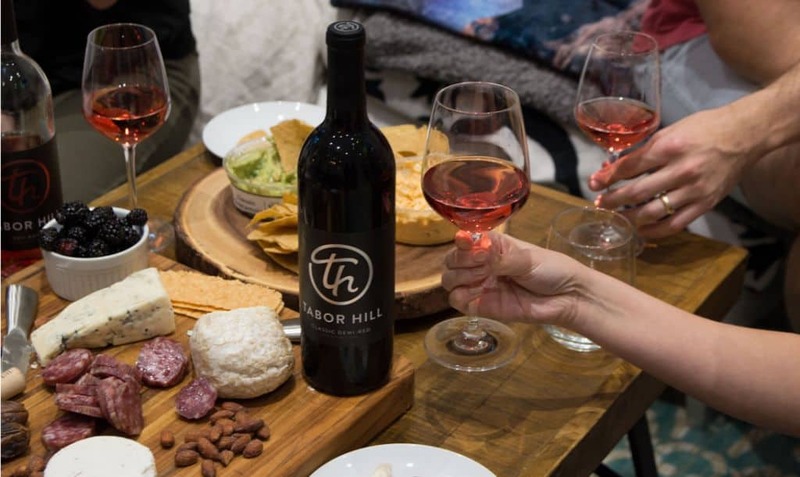 There are multiple Southwest Michigan wineries to choose from, but Tabor Hill is a must visit. I was super excited when I received a Tabor Hill restaurant inspired salmon spread. Little did I know, the group I entertained did not eat fish! But, that doesn’t mean I can’t share it with you! 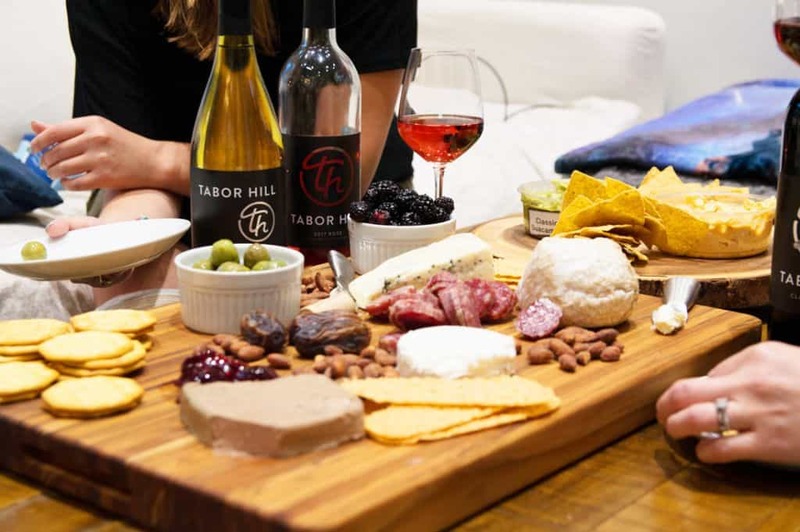 A great accompaniment with any of the Tabor Hill wines featured in this post. Preheat oven to 350 degrees. 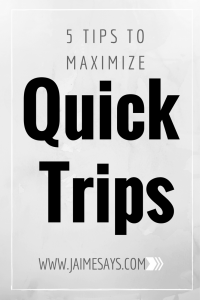 Slice bagels crosswise into ¼ thick slices. Lay bagel chips onto a baking sheet and bake in the oven until toasted, about 6-8 minutes. Remove from the oven and let cool. Add cream cheese to the bowl of a stand mixer fitted with a paddle attachment. Whip until light and airy, about 3 minutes. Add smoked salmon, scallions, salt, pepper, paprika and Worcestershire sauce. Mix on medium speed for 2 minutes until well combined. Place smoked salmon spread into a serving dish and top with capers and red onions. Serve with bagel chips.